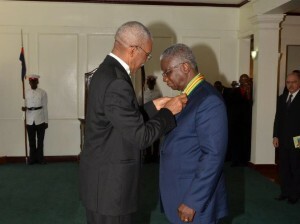 President David Granger said he bestowed Guyana’s highest national award on Barbados’ Prime Minister, Freundel Stuart earlier this year as a reward for that Caribbean leader’s support on the border controversy with Venezuela. “Prime Minister Stuart was forthright in telling the Venezuelan Vice President (Jorge Arreaza) that the decree had to be withdrawn so the award was a reward for the stand that he took for Caricom and we are proud of Prime Minister Stuart and what he did for Guyana and what he did for the Caribbean,” he said on the latest weekly edition of the interview programme, “Public Interest”. Granger said the Barbadian leader played a major role in calling for the scrapping of a decree by Venezuela’s President, Nicolas Maduro’s on May 26, 2015- Guyana’s 49th Independence Anniversary. That decree had unilaterally extended that Spanish-speaking neighbour’s maritime boundary to take in all of the Atlantic sea off Essequibo and the sea space of several Caribbean Community (Caricom) member states. The issue has been subsequently discussed by Caricom leaders at their annual summit in Bridgetown, Barbados. Stuart last year attended Granger’s inauguration as President and was here in May for Guyana’s 50th Independence Anniversary celebrations. Earlier this week, the Guyanese leader paid a return visit to Barbados for that island’s Jubilee independence anniversary. 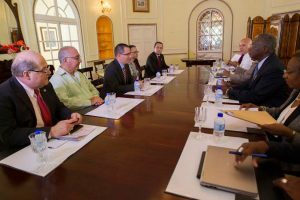 FLASH BACK: CARICOM Chairman, Barbados Prime Minister Freundel Stuart (sitting right, at centre) told Venezuela’s Vice President Jorge Arreaza (directly opposite Stuart) that Barbados and CARICOM stand by Guyana on the maintenance of its territorial integrity. Demerara Waves has been reliably informed that several Caricom countries that benefit from Venezuela’s PetroCaribe and ALBA arrangements had been not taken a solid stance in favour of Guyana. High-level Guyana government sources have described Dominica and St. Vincent and the Grenadines as “the elephants in the room”. Guyana is currently awaiting the outcome of an assessment by the outgoing United Nations Secretary General, Ban Ki Moon on whether the border controversy should be taken to the International Court of Justice also known as the World Court. Venezuela wants the controversy over the 1899 Arbitral Tribunal Award for the demarcation of the land boundary to remain in the hands of a United Nations Secretary General-appointed mediator. However, Guyana says mediation has not worked for more than 20 years and it is time that the controversy be settled by arbitration in keeping with the Geneva Agreement. Successive Guyana governments have said that instead, Venezuela has engaged in provocative acts such as scaring away investors onshore and offshore Essequibo including the seizure of a seismic research vessel several years ago that had been conducting a survey on behalf of a United States-based oil company, Anadarko. Apart from writing the United States-headquartered oil giant, ExxonMobil, cautioning against oil exploration and exploitation offshore Guyana, no further action has been taken even as the company prepares to begin commercial production by 2020.